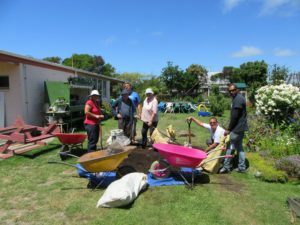 By joining our community of regular donors you can help us to continue to run these gardens in an efficient and meaningful way for so many of the community. This can be a one-off donation or regular payments. Internet Banking – The New Brighton Community Trust 03-0814-0296592-000, please use donation as a reference and email us if you need a receipt. Volunteer your time and join us down at the gardens, we do not have individual plots but work together to achieve a common goal. All volunteers who work for 2 hours a week are able to take home fresh vegetables and seedlings. Working in the garden offers physical and mental health benefits from exercise to stress reduction. All who come to the gardens benefit by the wonderful, peaceful, inclusive environment that we have and continue to develop. People feel uplifted, growing vegetable knowledge is improved, and also eating habits are improved. Contact us at nbgardens@xtra.co.nz if you wish to know more.